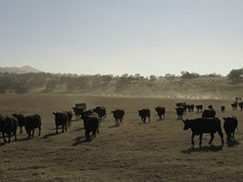 Rangeland livestock producers were among the first agricultural communities affected by California's worst drought in 500 years. Through surveys and interviews, we have worked with the ranching community to identify key strategies	for coping with and adapting to drought. Ranchers and rangeland managers have also shared that social media has provided them with new tools for peer-to-peer learning, public education, and extending knowledge to larger audiences. Insights from managers' experiences are important for adaptation planning to enhance resilience of rangeland social-ecological systems to climate stresses. UC Rangelands Blog. 2017. Coping with drought via adaptive rangeland decision-making. Macon, D.K., et. al. 2016. 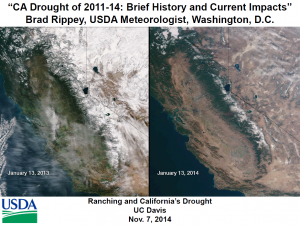 Coping with drought on California rangelands. Rangelands 38: 222–228. Roche, L.M. and K.W. Tate. 2014. 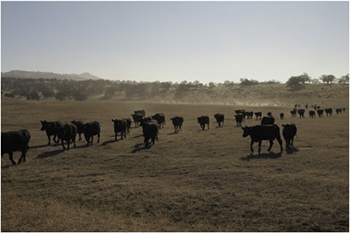 Drought: Ranchers' perspective and management strategies. Policy Brief. 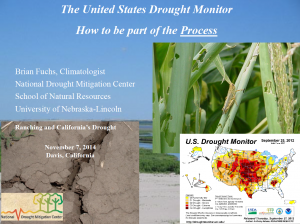 On November 7, 2014, we brought the U.S. Drought Monitor authors and the California State Climatologist to UC Davis to talk about 1) how the U.S. Drought monitor is updated weekly; and 2) how local expert knowledge, real time ranch impacts, and other relevant data can be used to inform the U.S Drought Monitor. 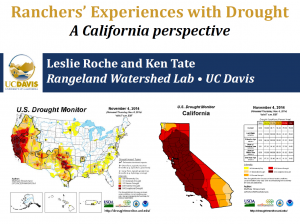 We also shared new information on California Ranchers’ perceptions and experiences with drought, new livestock feeding strategies during drought, and seasonal weather forecasts for California. 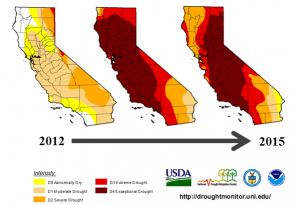 Panel - Questions and Discussion about the Drought Monitor and California. As the NDMC’s Monitoring Program Area Leader, Mark’s duties include overseeing the center’s operational national drought monitoring activities. Mark co-founded the development of the U.S. Drought Monitor (USDM) in 1999 and serves as one of the principal authors of both the weekly USDM and monthly North American Drought Monitor products. He currently sits on the American Meteorological Society’s Applied Climate Committee as well as NOAA’s National Integrated Drought Information System (NIDIS) Program Office’s Implementation Team. 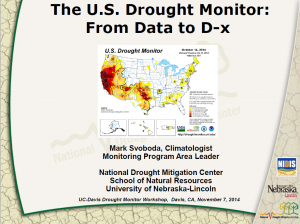 Climatologist with the National Drought Mitigation Center at the University of Nebraska. I am one of the 11 US Drought Monitor authors and have been working in the applied climate field for the last 15 years. My research focus deals mainly with drought monitoring and the development of tools and information for stakeholders. Brad Rippey is an agricultural meteorologist with the U.S. Department of Agriculture's Office of the Chief Economist, and the managing editor of the Weekly Weather and Crop Bulletin. He is one of eleven rotating authors of the weekly U.S. Drought Monitor. Prior to joining USDA in 1998, Rippey worked as a meteorologist with the U.S. Department of Commerce for more than 10 years. Leslie's research is focused on the economic and ecological sustainability of rangeland livestock production systems. She works collaboratively with ranchers, agencies, and other stakeholders to investigate relationships between rangeland management, livestock performance, soil health, water quality, vegetation dynamics, habitat quality, and sensitive species conservation. Recently, she has expanded her work to include linked social-ecological aspects of ranching such as goal setting, decision-making, and drought adaptation strategies. Glenn Nader, Livestock and Natural Resources Advisor, UC Cooperative Extension. 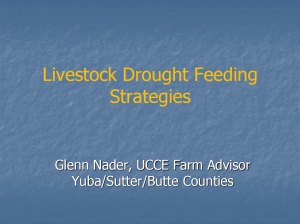 Glenn is responsible for applied research and education on livestock and natural resources in Yuba, Sutter, and Butte counties. He works with ranchers on feeding strategies for livestock during drought, sustained ranching, ranch budget analysis, general livestock nutrition and health, and marketing. Glenn is a 4th generation California rancher. I provide technical support to programs within the Department related to observations, planning, forecasts, and projections of weather and climate. I have 10 years of experience in my current position and spent the previous 15 years at the University of California Davis getting my advanced degrees and post-doctoral research in the area of hydroclimate studies. 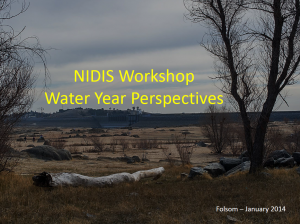 For the current drought, I provide information on the historical positioning of the magnitude and duration of the drought, outlooks for future evolution of water conditions, and provide outreach in the form of presentations and interviews. I also serve on the Department’s Drought Management Team.